I always love it when the kids get more fruits and veggies throughout the day. 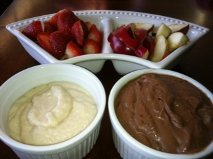 One of the ways to do this is to have it is a dessert or for breakfast and adding a dip helps make eating fruits a little more fun. These are easy to make and a great dairy-free alternative to yogurt based dips. 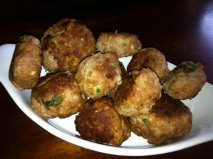 The recipe is from www.everydaypaleo.com. I also have a dull salad knife and fruit cutting knife that I let the kids use to help chop some of the fruits to put in the dip. When they’re involved in the process, although it can be slower and a little more messy, they enjoy eating it a little more. It’s Saturday night and my 2 nieces are here for the night for a sleepover. When I put the kids to bed, they wanted to know what was for breakfast. Since it’s Sunday tomorrow I thought I’d bake them up a treat, a healthy one though. So, Blueberry Coffee Cake it is. I’ve never tasted it but judging by the smell and a sample of the topping, it’s going to be delicious. I have yet to taste anything from www.thespunkycoconut.com website that isn’t great. I have her recipe book and love it as well. The other thing I love about this recipe is the ability to use some organic local blueberries, even in the winter since we have access to frozen local blueberries in Nova Scotia. I didn’t use the 9″ cake pan as it calls for in the recipe since I don’t have one yet. Pour into greased 9″ ceramic pie dish. Spread evenly. Add about 3/4 cup blueberries and press them into the batter. Add half of the crumble topping. Press it down slightly. 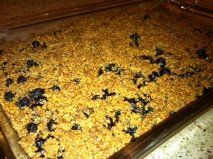 Add the other half of the crumble topping and about 3/4 cup more blueberries. Last week, we hired a chef to cook for us and our phenomenal staff. 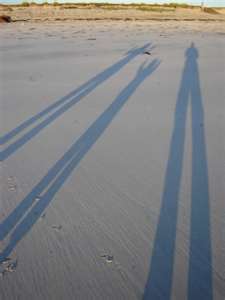 Two of them have recently purchased a new home, one completed her MBA and one is leaving us in the next few weeks. We had a lot to celebrate. 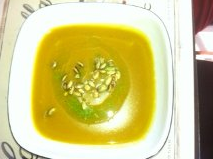 Chef Chris from www.flyingaproncookery.ca made a delicious squash soup and graciously allowed us to post his recipe. I haven’t made it yet but if it tastes anything like his, I’ll be over the moon…so nutritious too! 1. 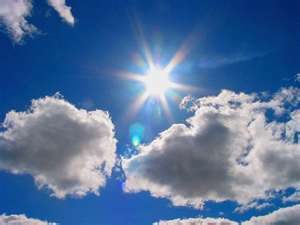 Preheat the oven to 375 degrees F (190 degrees C). Pour a thin layer of water in a baking dish, or a cookie sheet with sides. 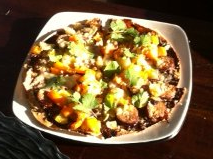 Place the squash halves on the dish and drizzle with the Maple Syrup. Bake for about 40 minutes, or until a fork can easily pierce the flesh. Cool slightly, then remove the peel. Set aside. 2. Heat Oil in a large pot over medium heat. Add the onion and garlic, and sauté for a few minutes, until tender. Pour the Vegetable broth and coconut milk into the pot. Cook for about 20 minutes, or until soft. Add the squash. Use a hand blender to puree the soup, or transfer to a blender or food processor in batches, and puree until smooth. Return to the pot. 3. Season the soup with cayenne pepper, allspice, nutmeg, ginger, salt and pepper. In a small bowl, combine almond flour, baking soda, salt and cinnamon. Transfer mixture to a large bowl and blend until completely combined. This morning, I was up a little earlier than usual which allowed me to get an unusual amount of things done before the boys were up. I thought there would be no better way to wake up on a weekend morning than to the smell of cinnamon rolls throughout the house. 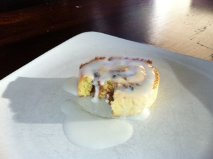 So, I attempted this recipe from http://urbanposer.blogspot.ca/2012/04/best-almond-flour-cinnamon-rolls-paleo.html. I must admit I was reluctant because I thought it might end up being quite messy having to roll the dough and all. I was pleasantly surprised when the recipe turned out to be quite simple and easy. My boys loved them! 3 cups plus 2 TBSP super fine almond flour (I make my own flour by first putting sliced almonds through the food processor. Make sure you re-measure the amount of flour after the sliced almonds have been ground. You may have to add a little more to make the desired amount of flour). 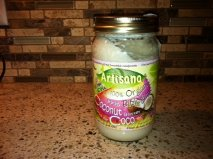 1/4 cup coconut butter at room temp (I bought my coconut butter at Planet Organic, I’m sure they have it available at most health food stores. I heated mine slightly in a saucepan, just enough to lightly cover the few that we were going to eat at the time. A couple of drops of vanilla stevia mixed in with 3-4 TBSP of coconut butter made it perfectly sweet). In the spirit of keeping things lower in the sugar department (since there is already honey on the inside), we like to drizzle the cinnamon rolls with warmed coconut butter. When we want something a bit sweeter, we also drizzle a little honey on them or add some stevia to the coconut butter. However, if you try mixing the coconut butter with the honey, you will just get a thick paste. In a seperate bowl, gently beat together the coconut oil, honey, and eggs. If the eggs are too cold, they might cause the coconut oil to harden. Add the egg mixture to the almond flour mixture. Mix (knead) until a decently smooth dough is formed. 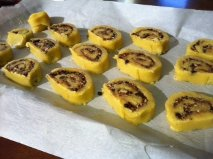 On a large piece of parchment paper, roll the dough out into about a 9×13 rectangle. Use a little almond flour, if needed, to keep it from sticking to the rolling pin. Sprinkle the raisins, grounds pecans and cinnamon over the surface of the honeyed dough. Now you’re ready to roll it up! Starting at the end closest to you, begin to roll the edge of the dough away from you. Try to start a tight roll from the beginning. Continue rolling until you have a nice uniform log. Use the parchment paper to help you roll if needed. Be gentle and careful when rolling up the dough. It is not as workable as a gluten based flour would be. Now roll the whole log of dough gently, lengthening it out just a bit (like making a snake out of play-dough). It is a good size when it is about a 4 inch round log. With a good bread knife, cut the roll into about 2 inch thick slices. I use the width of two fingers as my guide. Then lay them cut side down on to a parchment lined cookie sheet. They do best spaced a few inches apart, but not connected. Bake in a 350 degree oven for 10-15 min. I suggest staying close to the stove and checking a few times while they are baking, as everyone’s oven cooks a bit differently. 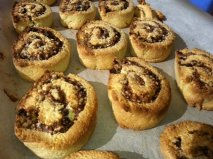 The rolls should be golden with a little browning at the top and the dough toward the center of the roll should be soft but not to doughy. If they bake too long they WILL become like hockey pucks! If cooked just right though, they will be heavenly. When ready, remove from the oven and let cool for at least 10 min. If you try to move them before then, they might break up. But if you wait for them to cool they will hold together beautifully. What to expect? These cinnamon rolls, if baked right are soft and lovely. Since it is not a yeast or gluten based dough they will not have that ‘stretchy, pull apart’ feel that a yeast/gluten based roll would have. I would consider them to be more of a soft ‘biscuit’ style cinnamon roll and less sweet than the traditional cinnamon roll. Also, under baking slightly is FAR better than over baking as almond flour can burn and dry out if over baked. Everyone’s oven acts differently, so keep an eye on them and they should perform amazingly for you. This dessert or snack to satisfy that chocolate craving is so creamy, you’ll never guess it’s made with avocado. Combine the above ingredients in a food processor. Blend until the texture is fluffy like a mousse. Refrigerate until it is time to serve. I made this as a birthday cake the other day and it was fabulous. 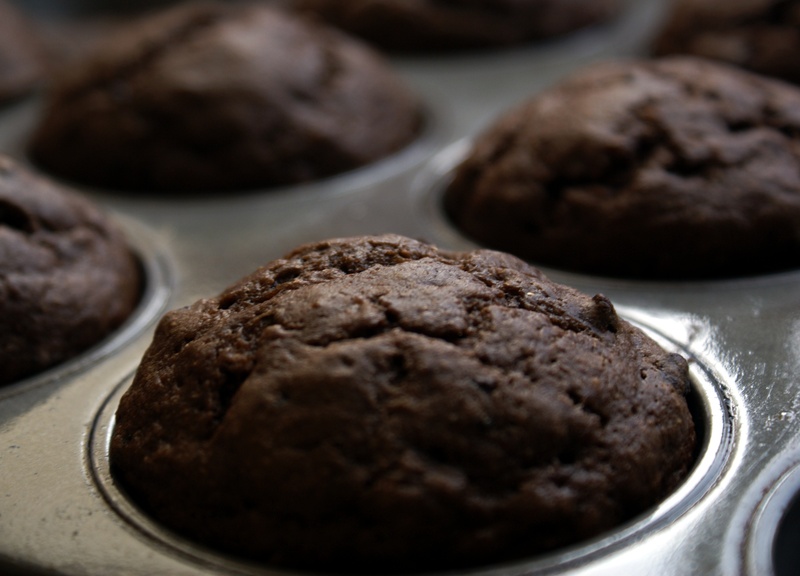 The best part is that compared to other chocolate cakes, it is much lower on the glycemic index, tastes just as good if not better, is extra moist, and very high in protein. You may also feel good after eating it vs bloating with sugar high then low. When the kids asked for seconds, I told them to go ahead, knowing it was actually good for them. I doubled the following recipe to make it 2 layers. Preheat oven to 325 degrees Fahrenheit. Spray a 9″ cake pan with extra virgin olive oil cooking spray, or just grease it with a thin layer of butter. Dust cocoa all over the inside of the pan, tapping to evenly distribute. Cut a round of parchment paper and line the bottom of the pan, then spray the parchment lightly. Drain and rinse beans in a strainer or colander. 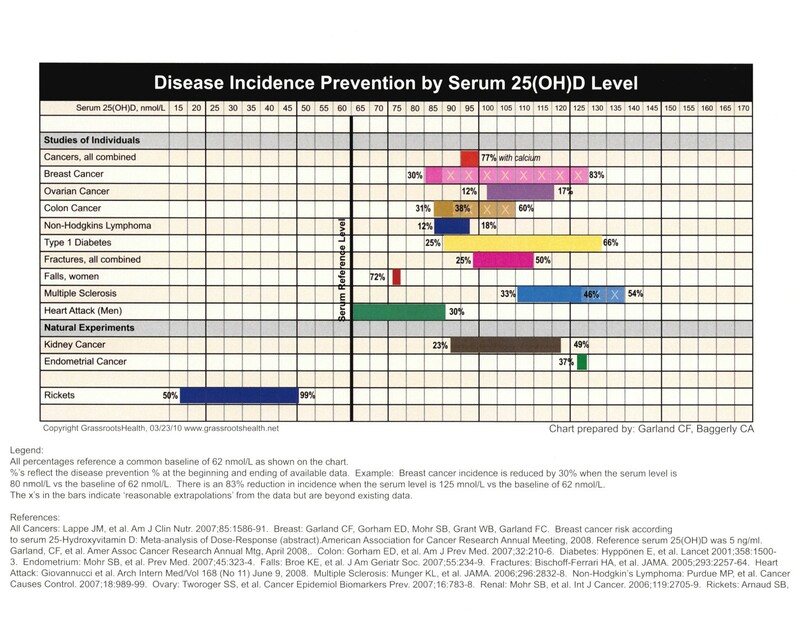 Shake off excess water. Place beans, 3 of the eggs, vanilla, stevia (if using) and salt into blender. Blend on high until beans are completely liquefied. No lumps! Whisk together cocoa powder, baking soda, and baking powder. Mix together honey and coconut oil. Add remaining two eggs, beating for a minute after each addition. Pour bean batter into egg mixture and mix. Finally, stir in cocoa powder, and beat the batter on high for one minute, until smooth. Scrape batter into pan and smooth the top. Grip pan firmly by the edges and rap it on the counter a few times to pop any air bubbles. Bake for 40-45 minutes. Cake is done when the top is rounded and firm to the touch. After 10 minutes, turn out cake from pan, and flip over again on to a cooling rack. Let cool until cake reaches room temperature. You can then apply frosting as per the directions below. I used my food processor and once I had strained the beans simply added all the wet ingredients and blended them together. In another small bowl, I mixed the dry ingredients until well blended then added them to the wet ingredients in the food processor. In just a few minutes it was all mixed together very well and was ready to be put in the pans. 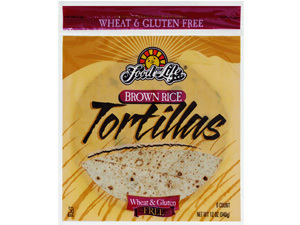 The original recipe came from the website www.healthyindulgences.net. 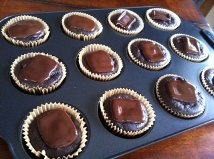 On the cupcakes, I put one square of 72% dark chocolate on each cupcake when I don’t have time to make a frosting (I buy a big bag of dark chocolates from Costco). I put it on while the cupcakes are still warm to let it melt. 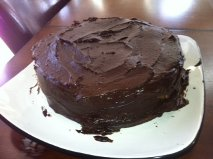 In this cake recipe I used a chocolate mousse recipe as the frosting and it turned out very well. 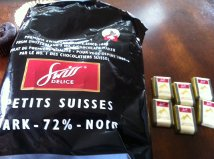 I also evenly placed some of the dark chocolates (from the bag I buy at Costco of 72% dark chocolate) in between the layers of the cakes while the cakes were warm. 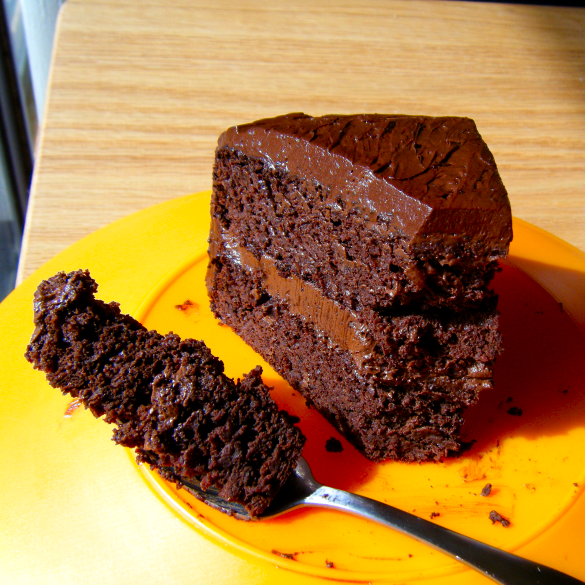 The chocolate squares melted and tasted really good as the middle layer of the cake. 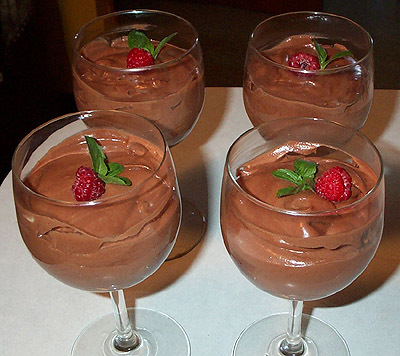 On its own, the following recipe makes a great chocolate mousse dessert. Add a little hazelnut butter in it for a more nutella-like flavor. Blend the above ingredients together in the food processor and once it is the right texture of a fluffy mousse, refrigerate until ready to serve. Since I used it this time as a frosting, I refrigerated the mousse until the cake was no longer warm then spread it evenly over both layers.